If you’d visited the Swiss village Grindelwald before 1880, you did not have to walk too far from the village borders before you reached the glacier. In fact, it was right there, reaching out almost to where the village began. Of course, in times when global warming has become a global political affair, these long-gone times of snowy, ice-cold winters and huge glaciers seem all but anachronistic. But Grindelwald still gets a lot of snow in the winters, and, even though the glacier has retreated to much bigger heights, winter tourism is still the biggest source of income in the “Berner Oberland” region. And the glaciers (the Upper and Lower “Grindelwaldgletscher”) are still visited by hundreds of thousands each year. But not only in winter, but also during the warmer months many people come, when the white cover vanishes and reveals the underlying natural beauty, the green hills and forests, the ice-cold (even in summer) springs and creeks, and the breathtaking panorama of the surrounding mountains. 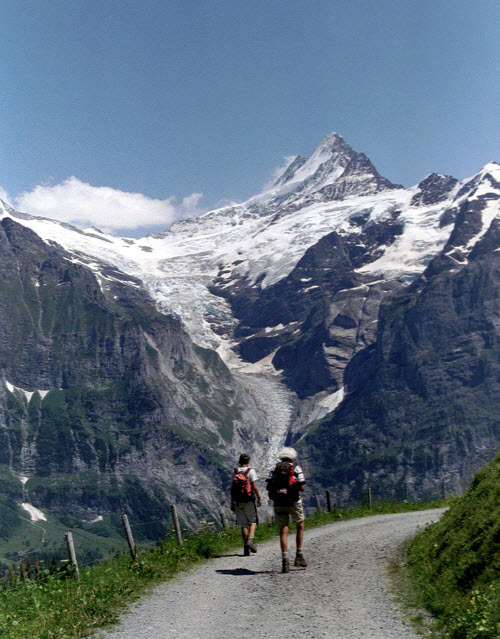 The most famous summits are “Wetterhorn”, “Schreckhorn”, “Eiger” (whose north face is one of the most notorious and deadly climbs in the alps), “Mönch” (monk) und “Jungfrau” (virgin). Those names may give you a glimpse of the centuries-old tales and legends and tragedies that these mountains cover. The lifts are also running in summer, so in case you want to spear yourself the arduous climb, just hop in and within minutes you will be on top of the world (or that is how it feels…). At 1,800 meters (5,900 feet), the “Bussalp” resting place awaits you with cold beers, warm dishes and great hospitality. Or maybe a little higher, the “Grosse Scheidegg,” a very popular meeting place for mountain-bikers and hikers. You see, there is a lot to do in summer, for sporty and not-so-sporty visitors. In winter, of course, all is white. Skiing and snowboarding dominate the scene. The beautiful slopes start as high as 2,971 meters (9,747 feet) and in the “Jungfrau” ski resort alone there are more than 160 km (100 miles) of slopes. Grindelwald is a year-round challenge and – definitely – worth a trip!